Before I get on with this week's links, if you didn't see Kate Gosselin change places with Kendra on Tuesday- you really missed a great show -and it gives me a lot more respect for both women. See it here. The Pope's last day is tomorrow!!! I thought it would be fun to look at some of the posts I have put up about our pope over the past few years. Great quote by Pope Benedict on soccer! How Pope Benedict's Election had liberal nun Joan Chittister in an uproar. Here is her article at the time of his election. Media reaction to Benedict's election - we'll probably see more of the same! You can read the Pope's final message at Joan's Rome Blog. Here is an excerpt. The pope just recently started tweeting on Twitter. I'm sure he's seen a lot of ugliness directed towards the church and towards him personally. 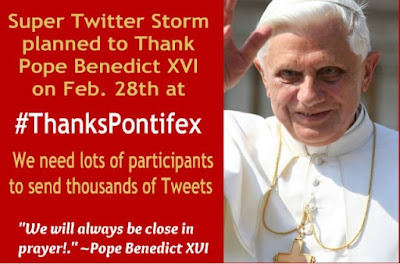 So join the super plan to Twitter Storm in appreciation of our beloved pontiff! #ThanksPontifex!! 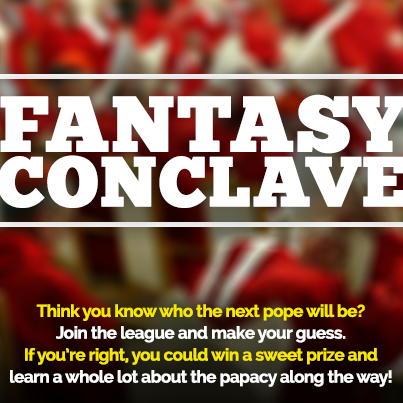 Finally, we will have a new pope soon, might as well have a little fun while we're at it! !Pick the new pope!